Maybe you are one of those folks who chugs numerous glasses of water throughout the day, even when not working in the sun. Or perhaps your thirst is far more conservative. Salvias are a lot like that. They don't all need the same amount of water in the same conditions. Also, local climate and other growing factors, including soil type, affect decisions about supplemental watering. Determining how much is enough to slake a plant's thirst depends, in part, on experimentation and paying attention to a plant's response to local weather. Water Loving -- A combination of local rainfall and supplemental watering significantly exceeding an inch of water weekly. An inch of water is roughly equal to .62 gallons per square foot. Watering at a cool time of day, such as early in the morning, helps to avoid evaporative loss. Our blog article Salvia Small Talk: What Is an Inch of Water? 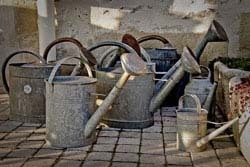 provides information about how to decide whether you are watering too much or too little. Rosy Bract Sage (S. rubiginosa). Dara's Choice Creeping Sage (S. 'Dara's Choice'). Peach Scarlet Sage (S. splendens van houttei 'Peach'). Different kinds of soils retain moisture for varying amounts of time. Establishing a happy balance in watering requires checking how slowly or quickly your soil releases moisture. Clay soils are notorious for holding water overlong and causing root rot, especially for extremely drought-resistant sages. In contrast, gravelly soils drain rapidly and may need more frequent watering than expected. Fortunately, tools for measuring moisture retention are simple. They include a screwdriver, trowel or long metal rod inserted in the soil to discover moisture depth. For more information about how to test for water, please read Salvia Small Talk: How to Determine Soil Moisture. And here's another helpful article -- Salvia Small Talk: Deep Watering vs. Sprinkling. You may find that you have more questions about efficient watering and how to make the best plant choices for local conditions. Please feel free to contact us. At Flowers by the Sea, we grow gardeners as well as plants.